An old Italian proverb says, ‘When the tummy is full the heart is happy’. 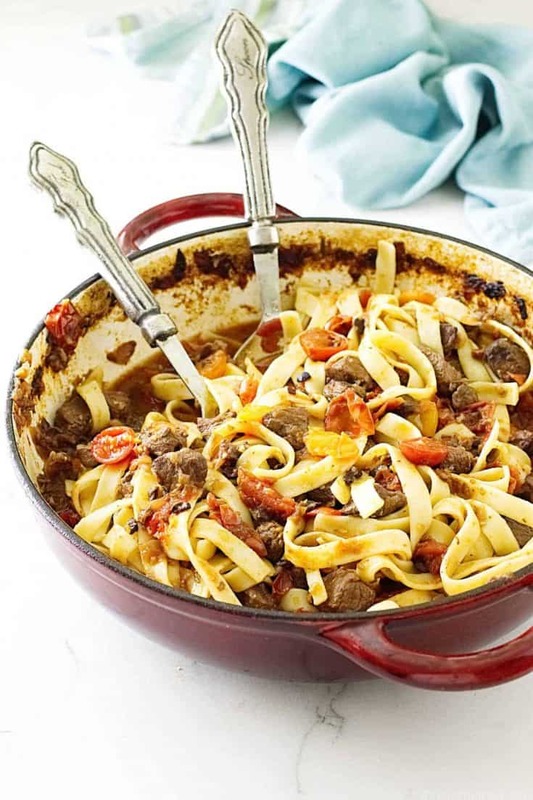 This Italian Lamb Sugo will surely fill your heart with happiness as it fills your tummy. 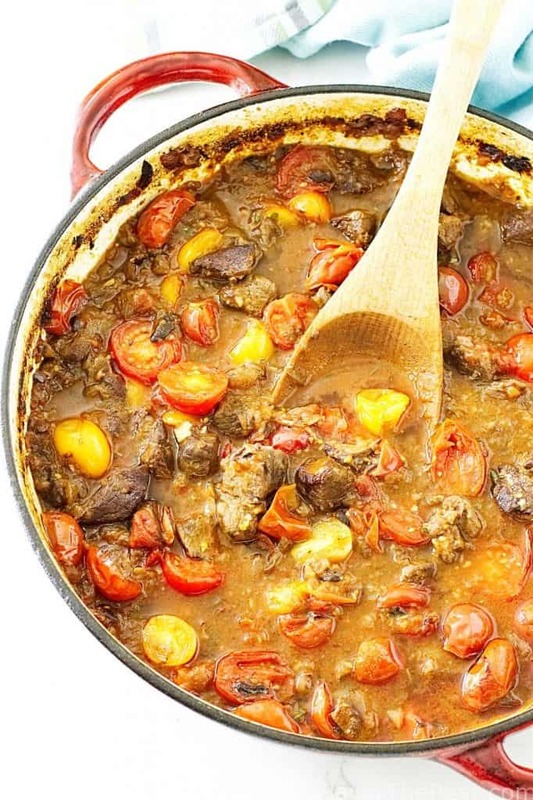 Our version of Lamb Sugo is made with lamb chunks, onions, garlic, fresh tomatoes, beef broth and red wine. The addition of cocoa nibs and a short cinnamon stick give this sauce a magical depth of richness. Sugo is another one of those great Italian red sauce creations that match up so well with pasta. The Italian translation for ‘sugo’ is ‘juicy’, ’sauce’ or ‘gravy’. Sugo is a variant of the Bolognese ragù and marinara sauce and it is prepared differently throughout the regions of Italy. Ground lamb or lamb chunks can be used in making lamb sugo. 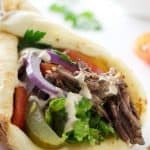 Our version uses lean chunks of lamb shoulder that is browned in a skillet. Similar to a Bolognese ragù we added onion, garlic, tomato paste, red wine, tomatoes and herbs. We also included cocoa nibs and a little cinnamon, both of which lend an incredible depth of flavor to the finished sauce. The mixture is braised long and slow in the oven where all the magic happens to the flavor of the sauce. Bolognese ragù originated in Bologna sometime in the 18th century. 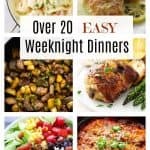 It is usually prepared with ground beef, pancetta, sautéed aromatic vegetables of onions, garlic, carrots, celery, tomatoes and wine. 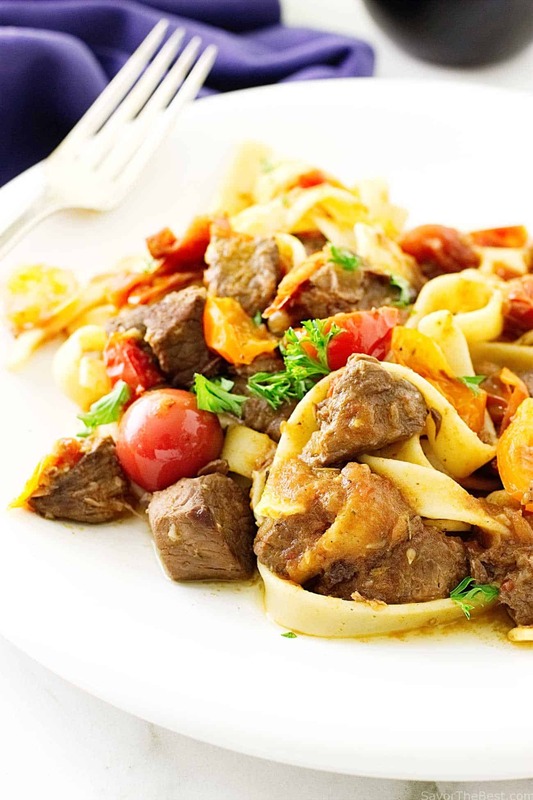 It is slow-cooked to achieve that thick, intense, flavor and served with a flat pasta such as tagliatelle or fettuccine. Marinara sauce originated in Naples, Italy. It is a quick-cooking sauce of fewer ingredients that include onions, garlic, herbs and a lot of tomatoes. 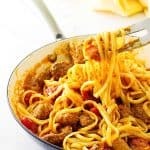 Oh, but how we love this sauce with big, juicy meatballs swimming in it and poured over a heaping pile of spaghetti strands or bucatini pasta. Are Cocoa Nibs Pieces of Chocolate? Cocoa nibs are little bits of the hulled cocoa bean. They are crunchy and have a little bitterness to them. 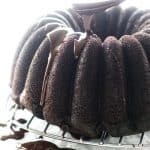 They are primarily used in making chocolate and unsweetened cocoa powder. But happily, they are also included in savory dishes. When cocoa nibs are used in savory dishes it is intended to enhance and balance out the flavors and will not taste ‘chocolaty’ at all. In fact, if you taste the cocoa nib flavor you will have over-done it. 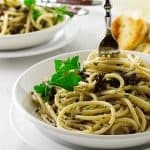 Using a warm spice like cinnamon or nutmeg with the cocoa nibs in savory sauces compliment each other in the balancing act and lends an incredible depth of flavor to the sauce. 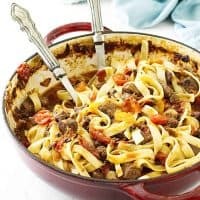 The lamb sugo simmers in a low temp oven for over two hours, it becomes thick and develops a rich mellow flavor, enhanced with the cocoa nibs and cinnamon. Then, after the cooking process is complete the sauce is finished with fresh heirloom cherry tomatoes and herbs. 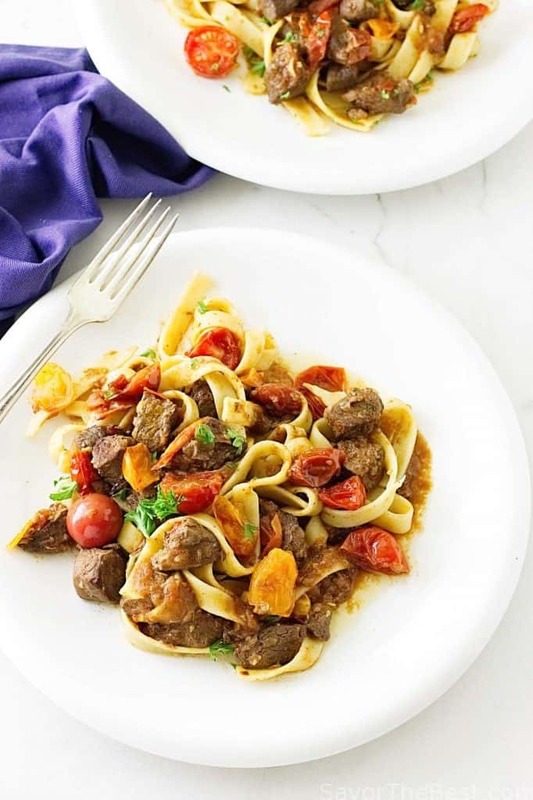 This lamb sugo is a wonderful feast when tossed with a flat pasta such as tagliatelle or fettuccine. All you need is someone to share it with, a crisp green salad, crusty bread and a good bottle of red wine. Yum! Our Lamb Sugo is made with lamb chunks, onions, garlic, fresh tomatoes, beef broth and red wine and simmered in the oven creating a thick, mellow sauce. The addition of cocoa nibs and a short cinnamon stick give this sauce a magical depth of richness. Add the oil to a large skillet set over medium-high and when it is hot, and working in batches, add the lamb pieces, turning to brown on both sides. As the lamb browns, transfer them to a paper-towel lined plate. When all the lamb pieces have browned, drain away all but 2 tablespoons of the fat in the skillet. Reduce the heat under the skillet to medium and add the onion and garlic. Cook until the onions are just translucent, about 3 minutes. Add the wine and stir to loosen any bits of lamb, stir in the tomato paste, mashing and mixing it into the liquid. Continue to cook and stir until the liquid has reduced by one-half, about 2-3 minutes. Return the lamb pieces to the pan and add the beef broth, cherry tomatoes, cocoa nibs, cinnamon stick and the bay leaf. Increase the heat to high and bring the sauce to a boil. Remove from the heat and transfer the pan to the pre-heated oven with a lid over it that is partially tilted. Let the Sugo cook in the oven for 2-1/2 hours or until it has thickened. Transfer the sugo from the oven to a workspace. Remove and discard the cinnamon stick and bay leaf and gently stir in the heirloom tomatoes, oregano and rosemary. Cover the pan tightly with the lid and keep warm while cooking the pasta. Cook the pasta according to the manufacturer’s instructions. Drain and toss with the lamb sugo. 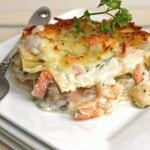 To serve, add portions to individual warmed pasta plates/dish garnished with chopped fresh parsley. Pass shredded parmesan cheese to guests to sprinkle on top of their portions. Woah! This looks really good. 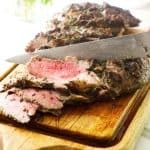 I am actually looking for lamb recipes as requested by a family member and would love to try this. Thank you for sharing. Wish me luck. This looks incredible. I so wish my husband ate lamb. He used to, but now, after 35 years, he thinks he never liked it. Poo. What a terrific post! Loaded with info. Love lamb, and rarely have it with pasta. Great sauce (and wonderful pictures) — thanks! Thanks for the nice kudos, John! This Lamb Sugo is delicious!